Think of summer and you may not instantly think of soup… but try one of our favourite recipes, and you’ll soon be slurping in the sunshine! From luxurious Fennel and Almond to homely Italian Minestrone, our summer soup recipes are good enough to get you in the kitchen – even if it’s smouldering outside! High summer in Britain’s most productive time: you can choose from a huge range of produce, and the diversity means that prices come down at local grocers, too. Get the kids shelling peas and make a fresh pea and mint soup – perfect served cold or hot, with a gremolata (raw garnish) of lemon zest and parsley on the top. Or press your vegetable patch into a full-of-goodness Gazpacho: a blended soup of salad ingredients with red vinegar, which gives you a healthy boost of energy. 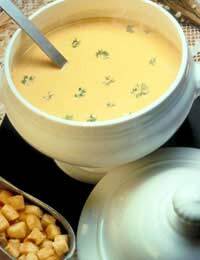 With new potatoes and spring onions ready to go, try making a light version of Vichysoisse by softening lots of spring onions in butter, adding diced potato and good stock, and blending before finishing with cream and serving cold. Other summer seasonal vegetables include radish, beetroot, new carrots, fennel, aubergine, courgette, garlic, summer squash, and oriental greens – and every crop has a range of soup recipes to go with it. Mix and match your favourite vegetables and herbs, and try creating one of your own: how about carrot and fennel, or squash and sweet potato? This is a fine soup, with a subtle flavour, that is good served in small bowls – a nice dinner-party starter. First, prepare the fennel bulbs: remove any discoloured outer pieces and slice the rest, discarding the feathery green shoots (which can be chopped and used to garnish, if you like). Wash then finely chop the celery. Melt the butter in a large saucepan. Put the fennel and celery into the saucepan and stir until the pieces are coated with butter. Cover with a lid and let the vegetables sweat very gently for 10 minutes. Remove the lid and stir in the ground almonds, cook for one more minute, then pour in the vegetable stock. Simmer for 15 minutes or until the vegetables are soft. Cool slightly before liquidising thoroughly. Now taste the soup and season if required. Serve warm, with a swirl of cream and a few almonds in each bowl. Minestrone is a classic summer soup. It calls for lots of seasonal summer vegetables - but don't stick strictly to the recipe - this can be adapted to whatever you have available. Warm the olive oil in a wide pan and soften the onion, garlic and celery. When it’s translucent, add the courgettes, peas, and beans and stir for another minute. Pour in the hot stock and bring to a gentle simmer; cook until the beans are tender, about 10 minutes. Add the borlotti beans, tomatoes, and pasta, and cook for a further 3-4 minutes (or until the pasta is just cooked). Remove one cup of the soup and puree in a blender, then stir it back in. Stir in the pesto and taste for seasoning. Serve, topped with a swirl of olive oil, shavings of Parmesan, and extra pesto to stir in, if liked.